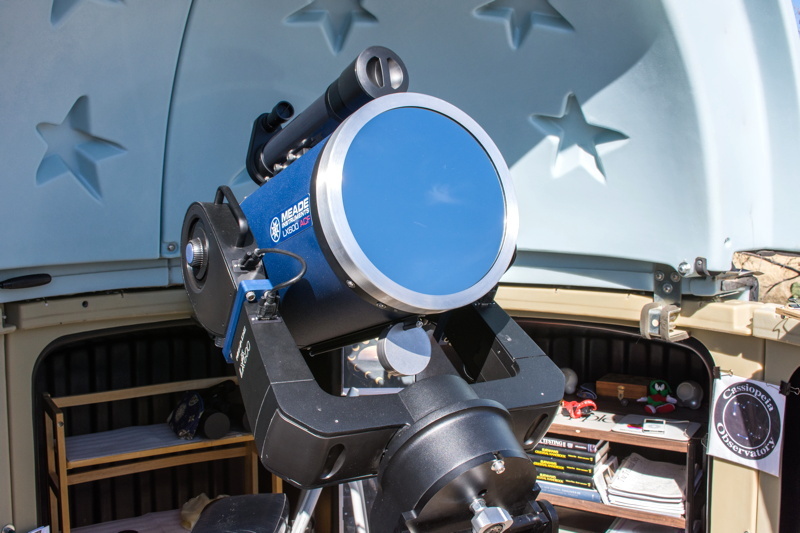 When I upgraded from the 8" LX200-ACF to the 12" LX600 telescope I knew I would need a new full aperture solar filter to replace the Orion Full Aperture Solar Filter. 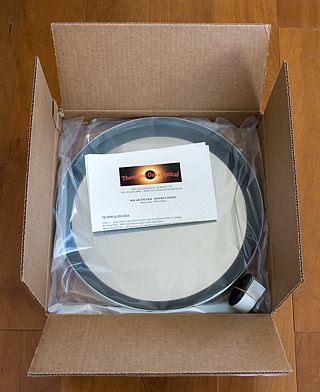 I have a Thousand Oaks Optical solar filter for my ETX-90RA, which is also used on my 70-300mm and 150-600mm lens for my D7200 DSLR, so I was comfortable with OPT's recommendation of this filter. The filter is suitable for both visual and photographic purposes. The box and filter is shown at the right. It contains the filter (very high quality), a sheet of instructions, and a short length of adhesive-backed felt to provide some security with the filter on the optical tube assembly. I had two apply a double thickness of the felt at four points around the inside of the filter mounting ring to adequately secure the filter on the 12" LX600 aperture. I am not thrilled by full aperture filters that use felt, instead preferring nylon screws that tighten down on the tube (like the Orion filter has). Felt can compress and become smooth with use, so it will be necessary to occasionally check the fit and replace the felt if necessary. The banding visible in the photo is an artifact of image processing since I was used a long focal length eyepiece. 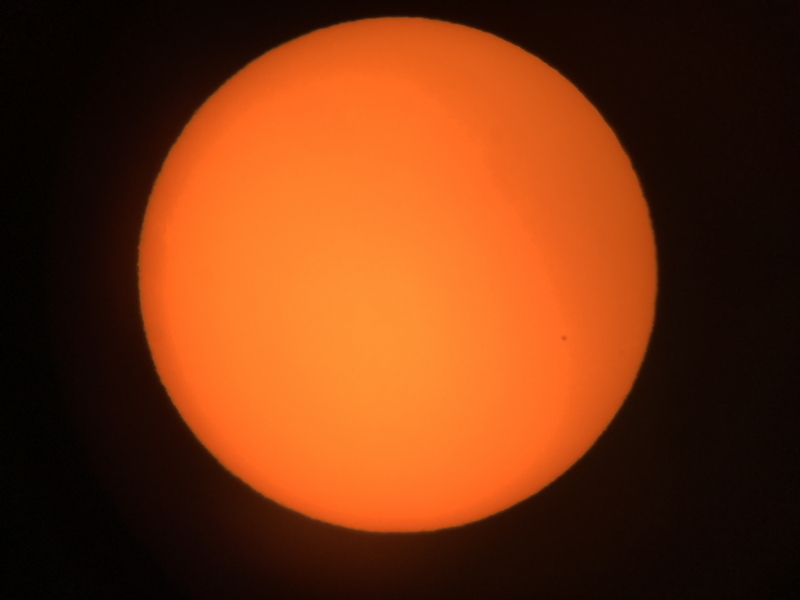 The two small sunspots are easily seen at the right. The coating on this filter is high quality on glass. I expect it to last a long time; the Thousand Oaks Optical ETX filter I have is 18 years old and is still performing great. 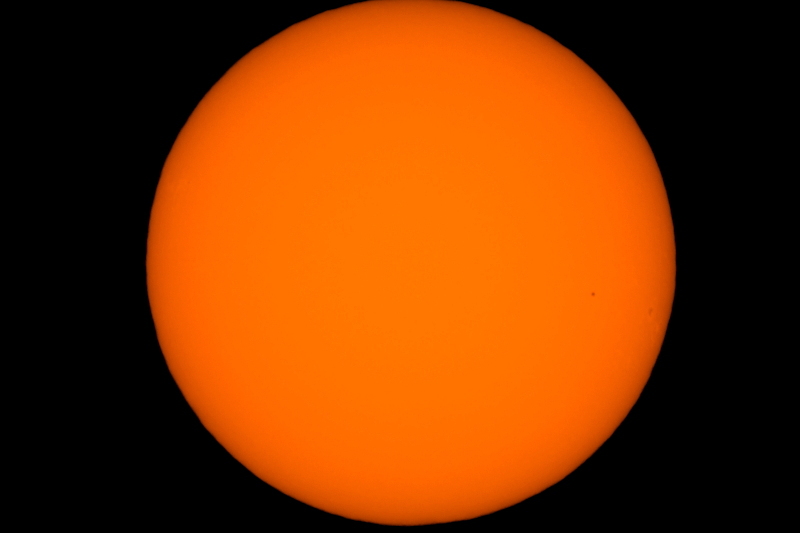 I will be doing more solar imaging with this filter, and of course, imaging satellite transits of the Sun (as I did with the 8" LX200-ACF). It performs as expected. The only concern I have is with using felt to secure such a large filter to the telescope.